I’m sure you’ve all heard the phrase ‘there is no ‘I’ in team’ right? Yes, that’s true, and this is not me trying to create a new word or ‘iteam’ here. 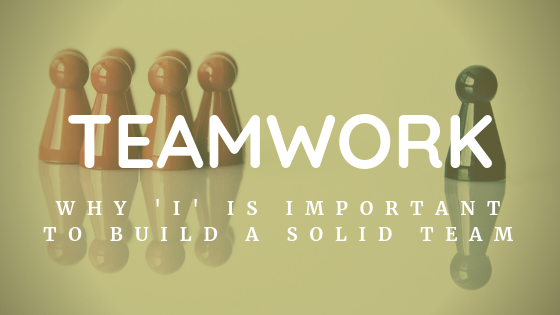 The ‘I’ I’m talking about is ‘INDIVIDUALITY.’ The uniqueness and traits we have as each individuals provide a solid and sound base for the structure of a successful team to be built around. Why is teamwork essentials? You see it everywhere, from the workplace to a sports team, you all work together to achieve a goal. Each playing a different yet vital role to ensure the specific goal is achieved. So why does teamwork sometimes go wrong within the workplace? We can put that down to many factors. One being lack of communication, the other being lack of co-operation even the reluctance of others to collaborate. I call it 3 C’s in teamwork. Communication, Co-operation & Collaboration. The Visionary: Usually the team leaders or managers who know what they want to achieve and the steps in order to get there. Visionaries are vital in a team as they set out a strategic map and approach to ensure everyone else is on path to achieve the team goal. They guide and steer others and provide the mentoring and support where needed. The Do-er: The active Do-ers are no nonsense individuals who accomplish tasks and objectives set out on a daily basis. They make enormous contribution through their everyday work, whom without the team goals cannot be achieved. It’s vitally important to ensure their work is recognised, acknowledged and that they are kept motivated. The Innovator: A team always requires a bright spark, one who sees things differently, comes with new ideas and approaches that could be make or break for an organisation. Which is why the innovator is usually in close connection with the visionary to ensure new ideas are in line with the overall objective of the organisation. The Communicator: One who echoes the key messages to everyone in the team. The Communicator is the voice of the team. All teams must have someone who can ensure that every instruction, message, objective or goal is understood by each individual from bottom up and not just from top down. The Critic: Known as the team analyst who scrutinises decisions, who questions the road ahead and the objectives set in place. Why? To ensure all gaps have been filled, all routes have been explored before a plunge is made. They are generally the problem solvers, the thinkers and tactician of the team. Usually working alongside the innovators, critics have a strong game to ensure the whole strategy set out by the visionaries and executed by the doers are in line without bumps and hiccups. So why doesn’t individuality matter? Because no two people are the same, which means when recruiting or setting up a team to achieve a goal, you must identify the skills you lack in the team and the personalities you need to ensure you build the right structure with personalities that can bring great work balance and deliver fast effective results to your overall strategic objectives.